This Is Getting Old: HATS OFF! Sidney Crosby led his team to a victory over the Buffalo Sabres Monday night with his 5th career hat trick and 3rd this season. Even more amazingly, all 3 of his goals happened within 8:02 in the 2nd period. Crosby has been having a "breakout season" (if that is even possible), scoring more than ever before. While Sid was certainly the main highlight of the night, there were plenty of other stories worth noting. 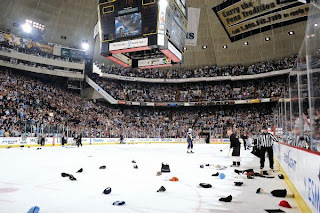 Jordan Staal scored on a breakaway pass from Evgeni Malkin sending the Igloo into an uproar because that was the tying goal at that point i n the game. Also, I would like to say congratulations to Mark Letestu for scoring his first NHL goal less than 1 minute into the first period. (picture on right) Once again, Marc Andre Fleury put in a great performance making sprawling saves in the closing seconds while Buffalo was on a powerplay. Buffalo goals were scored by Roy, Vanek, Kennedy, Pominville. The Pens next game is Saturday against Montreal.